Late Preclassic to Protoclassic, circa 300 B.C. to A.D. 250. This caricature-like stately female statuette, holding both hands to the mid-torso, has deeply recessed, delicately formed ‘coffee bean’ eyes and mouth, very pronounced nose, and is adorned with a brimmed hat, multiple appliquéd and white pigmented ear ornaments and rosette-like shoulder decorations, a triple stranded necklace with five red-pigmented oval medallions, all in relief. The lower torso is covered with a deeply incised cross-hatched design with strong remains of red pigment flanked by flanging etched tassels with traces of white. Red pigment remains as a facial and garment coloring, in addition to the white coloring on the ornaments and faint remains of black vertical lines beneath the red on the legs and back. 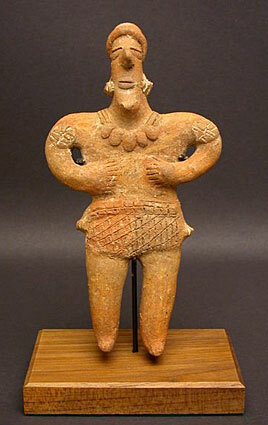 This figure is a creation from the early Colima culture of West Mexico. The rare and unique statuette captures the charm and seemingly humorous caricature of a high-ranking personage through the eyes of an ancient sculptor, and also reflects influences from neighboring styles of the time, including those of Jalisco and Michoacan. Provenance: She was acquired for a distinguished Los Angeles area collection more than forty years ago. Condition: The condition of this sculpture is excellent and is mounted on a custom teak stand.